Archbishop Carlson has called us to continue to beOne in our efforts to secure the future of Catholic Education in the Archdiocese of St. Louis. To whom can we pray and ask for guidance? Two saints, St. Elizabeth Ann Seton and St. John Neumann, whose feast days are today and tomorrow, are excellent choices. Elizabeth Ann Bayley Seton was the first native-born American to be canonized by the Church. She experienced both wealth and poverty in her short 46 years, and converted to Catholicism because of the evangelizing influence of her Italian friends with whom she lived after her husband’s death. She accepted God’s will—“The Will,” she called it—which for her, was to serve the poor, especially in their need for a Catholic education. And so, she instituted the first free Catholic school in America, and began her life as a consecrated religious. She founded a new order known as the Daughters of Charity of France. She established two orphanages and another Catholic school before she died of tuberculosis. What if there are other issues on our hearts and in our minds today beyond Catholic education? St. Elizabeth experienced great suffering in her own life, and she is the patron of in-law problems, parents who have lost children, and children who have lost parents. She lost her money and social status after her husband’s death, and embraced her poverty and simple life in service to the poor. Shortly before Mother Elizabeth Ann Seton died, John Neumann was born in Bohemia. An apt student, fluent in six languages, he longed to be ordained a priest. Incredibly, given today’s reality, there was such an abundance of priests in Bohemia, and all over Europe, ordinations had been suspended. Undaunted, John wrote to the bishop in America, and was ordained in New York—a vast territory he traveled by horse, even though he was so short his feet did not reach the stirrups. Like St. Elizabeth, John longed for community and to serve the poor, so he joined the Redemptorists, and eventually, was named Bishop of Philadelphia where he organized the first diocesan Catholic school system in America. Under his leadership, the number of Catholic schools grew from two to 100! 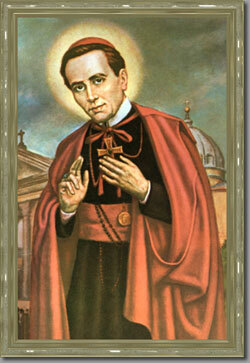 St. John Neumann faced some of the same challenges we face in our daily lives. He, too, often felt discouraged by constant conflict with religiously- and racially-prejudiced people, as well as anti-Catholic riots and arson of religious buildings. Today, let us ask St. John Neumann and St. Elizabeth Ann Seton to help us ensure that Catholic schools remain models of Christianity, evangelizing both within and beyond their doors and boundaries. We also pray that St. John will guide us in our efforts to beOne—in strength and unity of purpose—when we are disheartened by the very same issues he faced. Everyone who breathes, high and low, educated and ignorant, young and old, man and woman, has a mission, has a work. We are not sent into this world for nothing; we are not born at random; we are not here, that we may go to bed at night, and get up in the morning, toil for our bread, eat and drink, laugh and joke, sin when we have a mind, and reform when we are tired of sinning, rear a family and die. God needs every one of us; He creates every soul,…for a purpose. He needs, He deigns to need, every one of us. He has an end for each of us; we are all equal in His sight, and we are placed in our different ranks and stations, not to get what we can out of them for ourselves, but to labor in them for Him. As Christ has His work, we too, have ours; as He rejoiced to do His work, we must rejoice in ours, also. And finally, let us ask for a special blessing upon our own St. Elizabeth-St. Robert Regional School in St. Charles, and St. John Neumann Apartments in Jennings, administered by Cardinal Ritter Senior Services. This is the tenth in a 12-day series of posts with the purpose of helping readers deepen their appreciation for, and celebration of, the 12 Days of Christmas, a season which traditionally concludes with the Feast of the Epiphany on January 6th. ⇐ Fr. Pastorius: Who is your higher power?